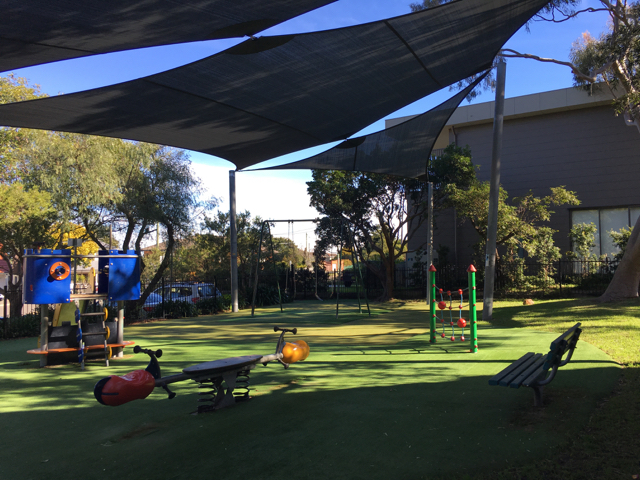 The Ross Street playground is located off Ross Street in Seaforth in Sydney's Northern Beaches area. It is a great playground for kids 1 to 6 years of age located near cafés and shops and a nearby church which is often used for community activities. This small yet popular playground is fully fenced due to the busy intersection nearby and nicely shaded with large shade sails. It has a small cubby house like structure with a slide, a fun see-saw, a small climbing structure and a swing set for infants and older children. Little Mister 2 loves this playground as he can climb onto everything! He loves standing at the cubby house-like structure and yelling out and going down the slide. The Ross Street playground is a relaxing playground which also has a sitting area, some nice trees and free parking next to the playground. There are no toilets however so plan accordingly or you can try the toilets in the nearby community centre near the church which is open at times.